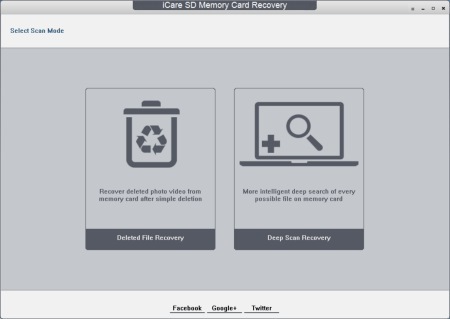 iCare SD Memory Card Recovery is an utility software designed for memory card that features to restore accidently deleted files such as photos, messages, videos, games, recover formatted card, recover inaccessible, missing files that missed by other data recovery utilities. iCare SD Memory Card Recovery support almost all types of memory card including SD(Secure Digital) card, cf(Compact Flash) card, MMC(Multi Media card), XD card, MiniSD card, SDHC, Smart Media Card, MicroSD card, etc which used on Android, digital cameras, and other digital devices. With Deep Scan Recovery mode or Deleted File Recovery modes, the software able to performs recover, restore, undelete files. In addition, the software also works with lots of file system such as RAW, FAT32, FAT16, FAT12, NTFS5, NTFS, and exFat. Restore photos, videos, audio files, documents, emails, and more. Recover lost files in 2 modes to ensure 100% success of data recovery. Recover formatted damaged, unreadable or defective memory cards. Recover files from removable storage including SD/memory card, USB/local drive and mobile phone. iCare SD Memory Card Recovery normally cost $ $69.99 for purchase. As part of promotional offer, the company is offering everyone with free genuine license of iCare SD Memory Card Recovery. Head to promo page HERE. On the page, you have 2 ways to receive the license code – “Like iCare Recovery on Facebook” or “Share icare-recovery.com – on website”. Choose either one to proceed and receive the genuine license key of iCare SD Memory Card Recovery. iCare SD Memory Card Recovery compatible with Windows XP, Windows 7, 8, 8.1, and Windows 10 operating System. You can share or follow us on Twitter, add us to your circle on Google+ or like our Facebook page to keep yourself updated on all the latest info from Microsoft, Google, Apple and the Web. © 2005 - 2019 Tip and Trick. All Rights Reserved.